U.S. citizen with (U.S./U.K.) dual nationality living and working abroad: How does one use their P60 to declare to the IRS? For a given tax year, how does one use the information provided in their P60 to calculate how income should be declare to the IRS? As I understand in the U.K. a tax year is between 6 April to 5 April. While in the U.S. it is between January 1 to December 31. For example, pertaining to U.S. tax year 2016, is it reasonable for a U.S. expat (i.e. permanently residing in the U.K.) to use each payslip, for the year 2016, to calculate total (foreign) income? Furthermore, should foreign income be calculate from gross or net? Long story short: You can't use the information presented on the P60 directly, because as you say - the tax year beginning/ends are different, so the P60 gives the "end of tax year" summary in the UK, but that's for the year from 6th April of (e.g.) 2018 to 5th April 2019. Not calendar year 2018. (I've no idea why it's like this in the UK -- IMO it would be much more sensible if our tax year was calendar year, as it is in most other countries, but thus it is!) Disregard the P60 for the purposes of US tax, but you do need to keep it for UK tax purposes. You use the gross figure but you have a "foreign earned income exclusion". You shouldn't normally need to pay tax to the US unless you are a high earner (in which case you should consult a US/UK tax expert ahead of any advice you find here). Source: was married to a US citizen for >10 years living in the UK and we had to complete these every year. The screenshot below is from our calculations used in our actual submission. I've "anonymised" it to £1000 per month (if your gross salary is £12,000 per year) and £1 savings interest -- obviously different figures would apply in your case. 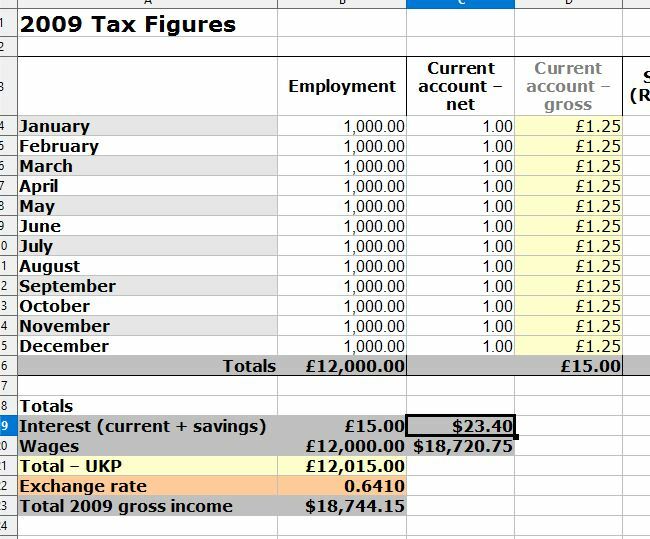 So here I had £12,000 of income (in the Jan-Dec period) and £15 of gross income from interest on savings accounts (you may or may not have that...depends on your circumstances). I then translated that 'gross income' into $ using the exchange rate tables from irs.gov. NB: 0.6410 was the amount in that year but you need to get the current figure. Then the total of all those was the figure to be declared. Not the answer you're looking for? Browse other questions tagged united-states taxes united-kingdom irs or ask your own question. Can the foreign tax credit be more beneficial than the foreign income exclusion?